TEA BENEFIT Tea contains caffeine, not as much as a cup of coffee, but more than enough to provide a stimulating effect. 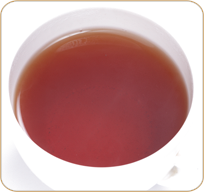 Tea also contains theanine - an amino acid that is known to change alpha waves in the brain and promote relaxation. That's why a hot cup of tea gives you that rare combination of calm and energy. Tea also contains theobromine, which has been used for about 100 years to treat edema, high blood pressure and cardiovascular disease. Catechins provide a protective effect against diabetes, stroke, cancer and heart failure. DESCRIPTION Nilgiri Leaf tea flavored with lemon. Take one heaped teaspoon of tea per 200 ml of freshly boiled water. Use a tea pot or a carafe. Pour water onto the tea. Cover and brew for at least 4 to 5 minutes. Adjust brewing time with strength and taste desired. Rinse pot after wards with hot water only. Do not use soap. Keep flavored tea pots separate from other pots. Add milk or sugar as per taste.